Royal Garden tapestry shows a wonderful scene of flowers in a grand garden setting, inspired by panoramic wall art by the artist Edourand Muller in 19th century. This French floral tapestry is in the style of elegant French art from the "Second Empire". This scene shows a beautiful arrangement of flowers in a hanging urn, decorated throughout the scene with flowers and foliage, over an arched trellis. The background shows a garden of columns and plants, while the abundance of flowers flow onto the border itself, almost bringing a three dimensional feel to the scene to invite the viewer right into this world that his tapestry has created. Filled with artistry and visual interest throughout, this floral landscape tapestry shows extraordinary beauty and elegance, as well as a sense of grandeur. 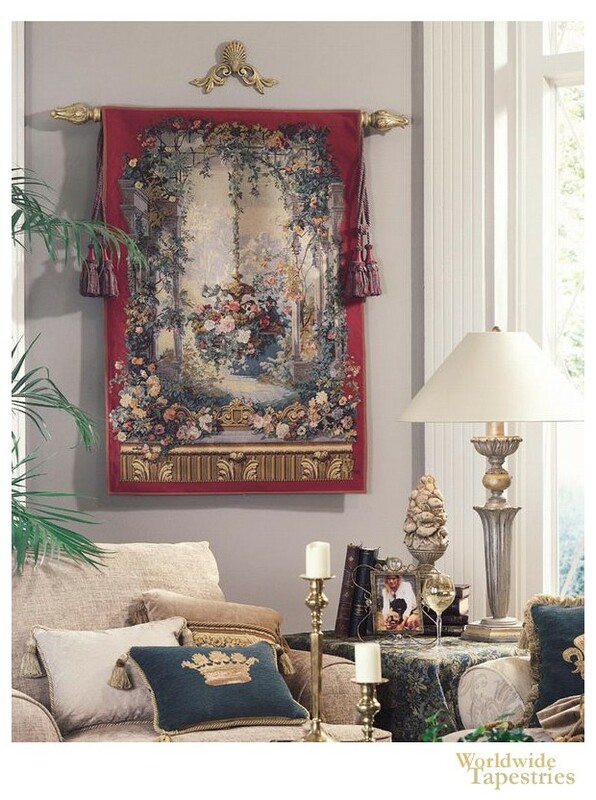 "Royal Garden" tapestry is backed with a lining and has a tunnel for easy hanging. Note: tapestry rod, tassels and accessories, where pictured, are not included in the price. Dimensions: W 56" x H 80"